Old Mill Candy Kitchen on Old Mill Street in Pigeon Forge. After lunch at the Pottery House Cafe & Grill, we walked around the Old Mill District to see what else they had to offer. At some point, we picked up a coupon book which had an offer for a free piece of fudge if you bought two from the Old Mill Candy Kitchen. Since we were already in the area, we decided to drop in. 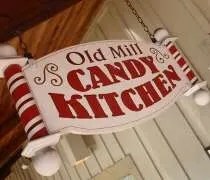 The Old Mill Candy Kitchen reminded me a lot of the candy shops on Mackinac Island. 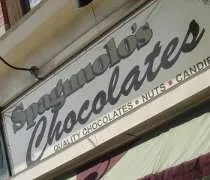 It’s in a tourist district on Old Mill Street and just like any good candy place, they make their creations right in the window so you can watch. Ryba's Fudge Shops on Mackinac Island. There’s really no other place on Earth where the main purpose of a trip could be to buy fudge. It wasn’t the main purpose of our trip, but it was a perk that we were looking forward to. We put off the actual fudge buying until we were ready to leave. Had we given in and bought fudge when we got there, we would have been eating fudge all day. Not a bad thing from a taste perspective, but you know what chocolate and sugar can do to you. After eating dinner at The Pink Pony, we started to make our way back to the Arnold Transit Company docks. We had been debating all day which fudge shop we would try. It was hard to make a decision because every store had a sign proclaiming “Best Fudge on Mackinac according to the Detroit News.” Like I mentioned in my post about the Island, they must just rotate every year. I freakin’ love fudge! 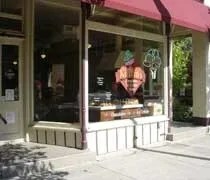 When we took a day trip to Traverse City last fall, we found a Kilwin’s Chocolate Shop in downtown. That was our introduction to the Northern Michigan chain of stores. 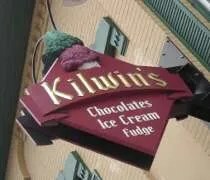 A Mother’s Day isn’t complete without chocolate and, as luck would have it, there was a Kilwin’s across the street from our brunch destination. After a good meal and a quick stroll through downtown St. Joseph, we loaded up on fudgey goodness. The St. Joseph Kilwin’s store is on State Street in downtown St. Joseph just a few blocks from Lake Michigan. Like most of the other stores, you can watch the candy makers apply their craft in the window. On the day we were there, one guy was making caramel apples an another was making fresh waffle cones. Since we didn’t have enough time to make a trip to my parents house south of Chicago, I talked them in to meeting us for lunch a little closer to the city. It had been over two months since J got a chance to see my niece, so I sweet talked my dad and brother with pizza. J and I got to the restaurant about 15 minutes before they did and when we pulled in, we noticed a candy shop a couple storefronts down. 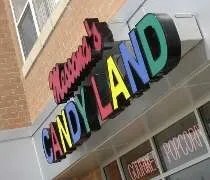 Messana’s Candy Land is near the corner of 183rd and Harlem Avenue not far from I-80. The store is in a mixed used building that looks to be pretty new. There are a row of stores on the bottom floor and a few floors of apartments above them. When we walked in, we didn’t know what kind of candy store we were walking in to. It was just before noon on a Sunday and we were the only ones there. There was a man and a women working behind the counter making popcorn and stocking shelves. I didn’t really have an intention of buying anything, but some of the things were just too good to pass up. Topper's Pizza on Grand River Avenue in East Lansing. Now that it’s NASCAR season again, Sunday’s can get pretty lazy. When the race is a west coast race, it really gets lazy because the race starts so late, it goes right through dinner. J and I were hanging out on the couch flipping back and forth between the Shelby 427 and the Illinois vs. Michigan State basketball game. Once we saw MSU had the game wrapped up, we started thinking about dinner. J suggested pizza. I was game. Once again, we tried Izzo’s Pizzeria in Old REO Town only to find them closed again. I continued to drive around before I ended up in East Lansing. Topper’s Pizza is on Grand River Avenue in East Lansing. The store is fairly new having opened just before Christmas. 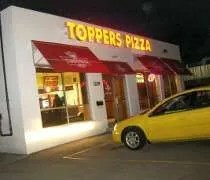 Topper’s is a chain out of Whitewater, Wisconsin with locations in Minnesota, Wisconsin, Iowa, Illinois, Indiana, Michigan, and North Carolina. The East Lansing location is the only Michigan location. Fudge is a weakness of mine. I have a hard time walking by a candy shop where I can see them making it in the window. After we left The Cherry Shop (review HERE), we continued walking down Front Street. It wasn’t long before we walked by two guys in the window making candy. They weren’t making fudge, but they were making caramel apples. I grabbed J and pushed her towards the door. When we got inside, my suspicions were confirmed. They had the most delicious looking fudge in a glass case near the door.